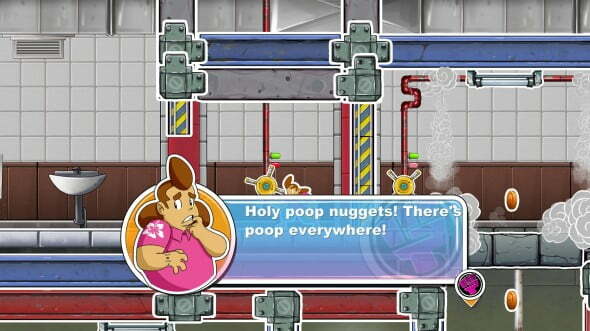 We review the quirky button-mashing throwback, Super Comboman! Can all of life’s problems be solved by punching baddies and throwing fireballs, or are there just too many bugs to function properly? Read more to find out! 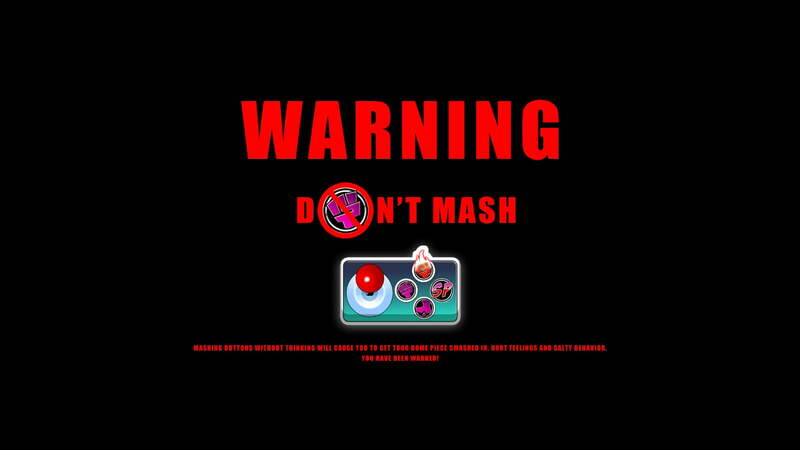 Growing up with Supersmash Bros., Street Fighter, Tekken, Mortal Kombat, and then the arcade four player games of The Simpsons, Teenage Mutant Ninja Turtles, and The Avengers, I have had quite the extraordinary relationship with button mashing, stress inducing, free-for-all fighting games. Finding the right combinations for a character’s special moves and watching in awe as your avatar hurls lightning, throws a boomerang or blows up someone’s head is always satisfying. And so, being able to choose your character from a list of four to thirty or more is exciting because of all the different moves and play styles each character has to offer. Interabang Entertainment’s Super Comboman, however, is a hybrid of sorts which mixes the playing styles of a multitude of arcade games and the Mario series, but only gives you one character to play. 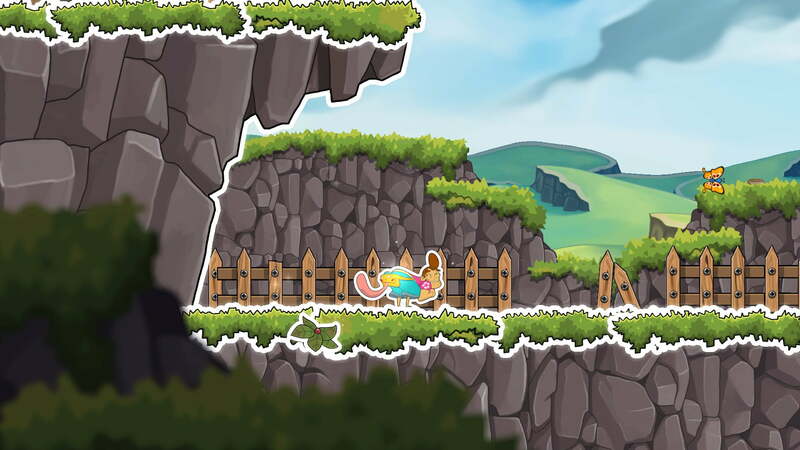 At first this seems like something Super Comboman can hurdle over, but unfortunately as you continue to play the game, a variety of glitches, bugs, and strange design choices plague Super Comboman’s lighthearted and silly, albeit all too often clunky, punch fest. What do you mean no mashing? What is this, chess? You start out in story mode as a slacker named Struggles (foreshadowing, much? ), a Hawaiian shirt wearing, tiny blue shorted, mulleted man-child, who is obsessed with comics and who needs money to pay for his house’s mortgage and so takes a job with the town’s construction company, DoDoCo, which seems to supply all of the enemies that you fight. That right there should be a warning signal for those who pick up the game, as the plot, of which little there is, makes no sense. But who needs plot when you can punch your problems away? To add to the oddness you are accompanied by your Pikachuesque satchel, which talks to you and is the face of the in between load screens with its mouth zipping open and closed. Zipper sounds included. 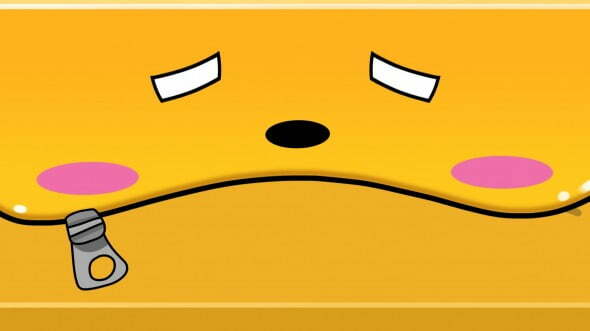 This face to be exact. The main map is artistically related to the Mario series with paths leading to different hubs where you can play or replay the various story missions. The levels themselves range in difficulty from childishly easy to ridiculously difficult, and sometimes both in the same level. It feels as if two different people with two completely different mindsets on level design vigorously fought over who should create different sections on a level-to-level basis, which is very frustrating and just plain weird. In some areas, enemies will get stuck, or your precious coins and upgrades will be unattainable because an indestructible box fell and got wedged between them. There are checkpoints spread throughout the levels for you to resurrect at when you die, and sometimes these are everywhere on a map, other times they are few and far between. Again, there seems to be little consensus on the overall structure of the game. But let’s forget about frustrating map design, as fighting is really what Super Comboman is all about. You can jump, punch, dash, stomp, and even throw fireballs, and the idea is to wrap as many of these up in a row to create intense combos, and for the most part it works. The moves are all fun, although some, like the fireball, don’t seem to work every time you try and get them to. Hitting targets is great, as is the sound that complements it in the same vein of the Adam West Batman series. There’s even an announcer who yells such things as, “Two piece and a Biscuit!”, “Fantastic!”, “Smizzle!”, “Scrubtacular!”, and “Noobtastic!”, and if your combos go really high, “Shenanigans!” This playful nonsense makes you forget about some of Super Comboman’s shortcomings. Unfortunately, those are not giant hairbrushes for your mullets. The way you get your abilities is through buying them at the store after collecting enough coins throughout the levels. There are abilities and perks. 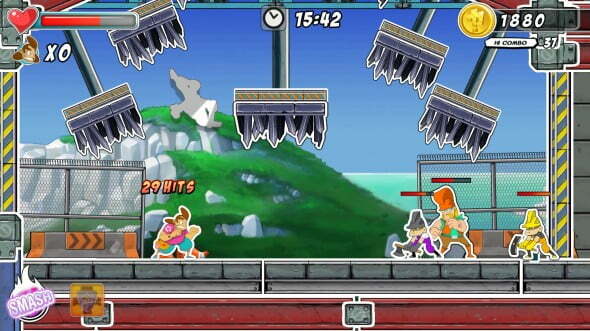 Abilities are activated by pressing a certain combination of buttons and joystick maneuvers. Perks are passive abilities which can help you in various ways. Since you can only ever have two perks on your character, you have to think about which ones you want. Perks only work after you reach a certain combo rating. Your first perk engages at 30, your second at 70, so you also have to decide which perk is more important. The healing parry perk, for example, heals you a small amount every time you parry an enemy’s attack. Super Comboman’s enemies are a mixed bag. Most are dressed in common construction garb (hardhats, drills, pickaxes, overalls), although a few look as if they had just come from the gym or the mall. Most are pretty standard fare, and they all try and hit you in your face. Others have wild attacks like a Wolverine lookalike who has claws, but stretch punches like Street Fighter’s Dhalsim, and also does a rapid combination punch like E. Honda. And then there are some that are downright annoying like the blonde valley girl who hits you with her hair and says, “Stupid” in a really annoying valley girl voice over and over again. That’s your talking fanny pack companion. It has a giant tongue. Just like the strange level design, Super Comboman’s enemies can kick the crap out of you by ganging up, or they can decide to fight you one by one like in a Hollywood movie while the others just sit by the sidelines and wait patiently, and seemingly mindlessly, for their turn. You don’t block in Super Comboman, but instead parry the enemies’ attacks. Since there is no limit to how often you can parry, you can pretty much dispatch most enemies one by one by parrying over and over again although it would get boring pretty quickly. Then there’s the music, which although it can and does get repetitive at times, is still entertaining. Think Dance Club+Funk+Ratatat+Tron and you have pretty much got an idea of what the background music is. There’s a lot of synthesizer, high hat, distorted guitars, and sweet bass lines. This all adds to the strange cup of tea that makes, for better or worse, Super Comboman. Throughout my experience with Super Comboman, I continued to find bug after bug and glitch after glitch, which continued to undermine what could have been a really enjoyable experience. After some levels, my medals for how well I did on a certain mission task would disappear, cutscenes would stutter, and on one particular level the sprinkler system slowed the rate of play to a crawl. This is unfortunate for a game which should just be about being silly and solving all of life’s problems with a super awesome, powered-up punch to the face. 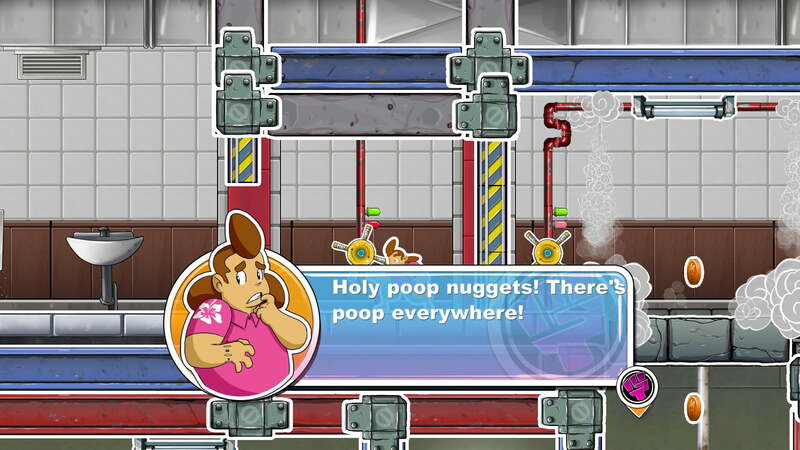 Alas, Interabang Entertainment’s Super Comboman is just too bugged to be enjoyable. 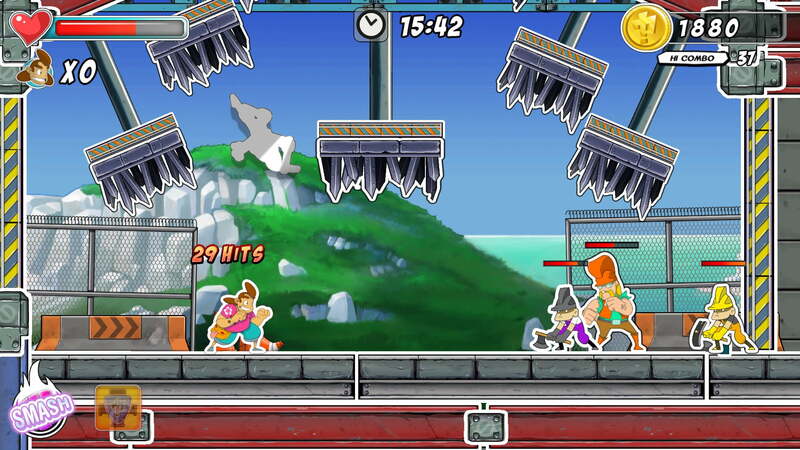 Interabang Entertainment's Super Comboman is a weird and wild adventure of punching and fanny-pack donning. Unfortunately, Super Comboman's myriad of bugs and annoying level design issues get in the way of making it a memorable and enjoyable fighting game. Christophe lives by Lake Merritt in Oakland, CA. He is a die hard PC gamer who started out with Everquest, Diablo, and Starcraft.